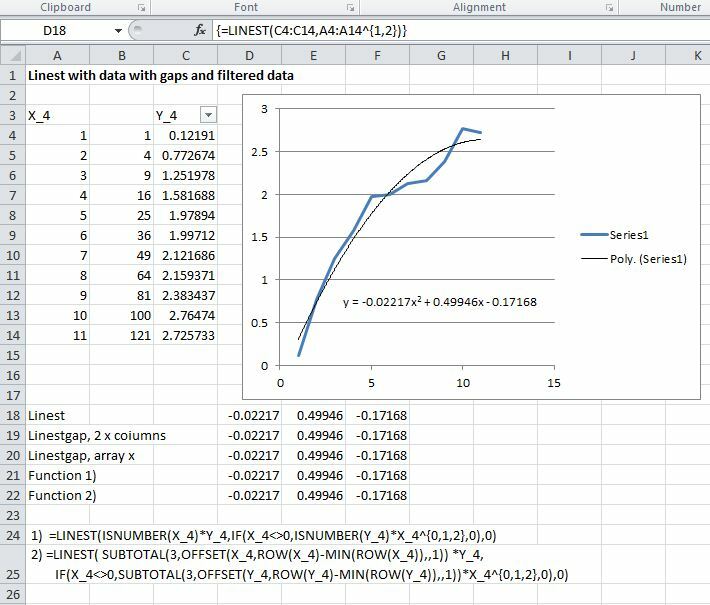 Copy and sort the data to remove the gaps. Use one of the on-sheet functions provided by Lori Miller in a reply to the comment. 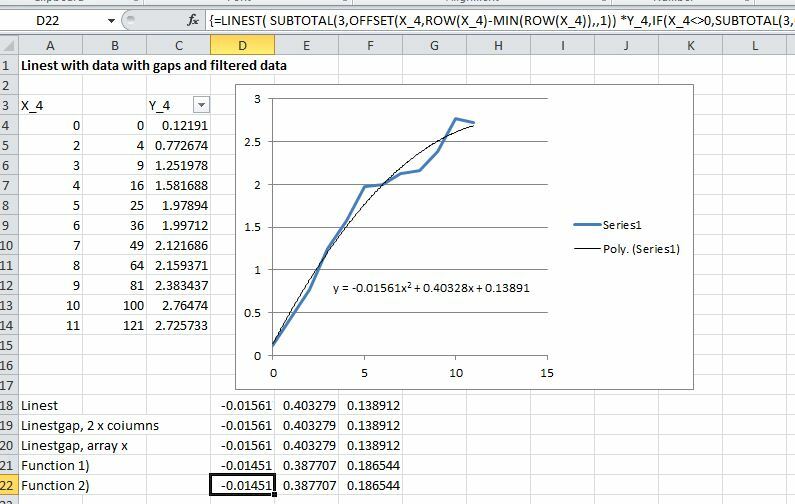 Use the LinEstgap() User Defined Function (UDF) that has been added to the Linest-poly spreadsheet. Deleting some data, the LinEst function returns an error, but the other functions return a result with the rows with blank cells ignored. This result is consistent with the chart trend line result. This entry was posted in Arrays, Excel, UDFs, VBA and tagged blank values, Excel, Linest, UDF, VBA. Bookmark the permalink. PS I’m not sure the latest version of the file is linked so perhaps the revised version be included instead? Thanks. Damned case-sensitive Unix file servers! I’ve linked to the right one now – thanks for letting me know. your simplified version looks great, i copied the 1E-99 version and confirmed that it worked… but i played around a bit with ISERROR and couldnt get it to work (it was always gives the same result as the other on-sheet functions, ignoring the X_4 = 0 data points). How would the complete formula look with ISERROR ? oh yeah.. thats right, 0^0=1 …. woops. guess im gonna go back to school.. i knew when i burnt my books after finishing high school that it would come back to bite me one day! 0^0 is actually an interesting topic in itself. In high school it is taken to be indeterminate since 0^x and x^0 give different values as x->0. Setting the value equal to 1 is a common convention in further study and simplifies expressions like the binomial theorem but most computer compilers throw an error for this expression. Much more discussion can be found in online forums. Doug, I tried to modify your UDF code to suit the case that the arrays are in rows rather than columns….but unsuccessfully. It’s for a second order polynomial. Can you help? Thankful for this post and the comments. Helped me get past my little obstacle. This code is exactly what I’ve been looking for. 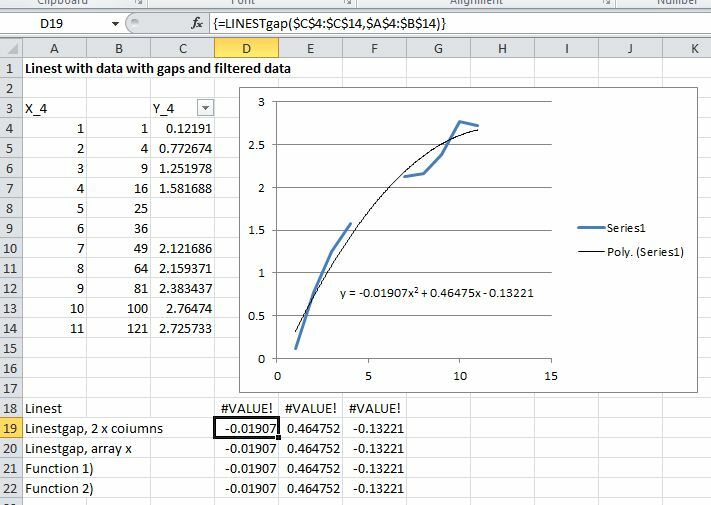 I am trying to get the Linestgap function in a spreadsheet I am working on. Move or copy -> create copy in my current worksheet doesn’t work. Could someone please advise? Can anyone give examples of using linest gap for the other common functions? 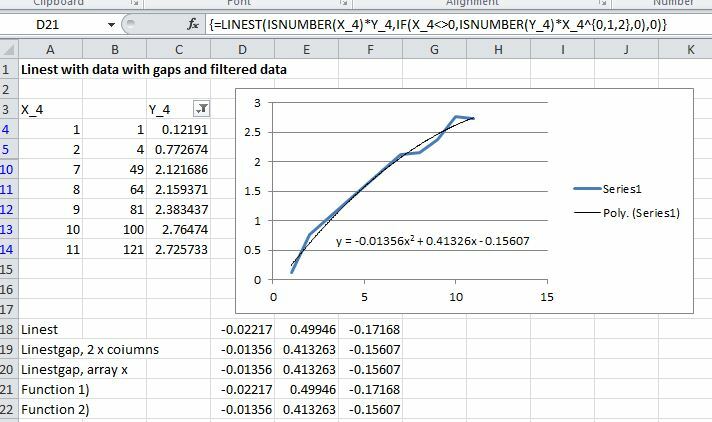 How can LinEstGap be used to determine r-squared values? Many thanks for the code. It works wonderfully and has saved me a lot of time in spreadsheeting processing. Just a quick question…if instead of blanks cells I had #NA, what would have to change in the code for it to be used ? You will be able to change some of the data to =NA() (or another error function), and that data will be ignored, rather than returning an error. If you open the function in the function wizard, you will see that the last argument is “IgnoreErrors”. The default is False. I would like to transpose the Linestgap-function from cells D20:F20 to cells G20:G22. Although whatever i try, i do not succeed. Is there a way to do this? It seems it is due to the array-format of the formula. Although there should be a method to enter the formula vertically instead of horizontally i suppose? Thanks a lot dougaj4, this works! I would like to run a multiple (!) factor analysis through linest, again excluding all rows that contain zeros (or if that’s easier blank cells). Is there a way I can do this using the above shown linest functions? FYI – my Y variables are located at C15:C26, my X1 variables are located at D15:D26, and my X2 variables are located at E15:E26. The example shown (and in the download file) has the x data in two columns. In the example the second column is the square of the first column, so it fits a quadratic function to the data, but it works the same if the two columns are independent variables, in which case you get the coefficients for y = ax1 + bx2 + c.
Also the x range can be as many columns as you want. It’s not limited to one or two.